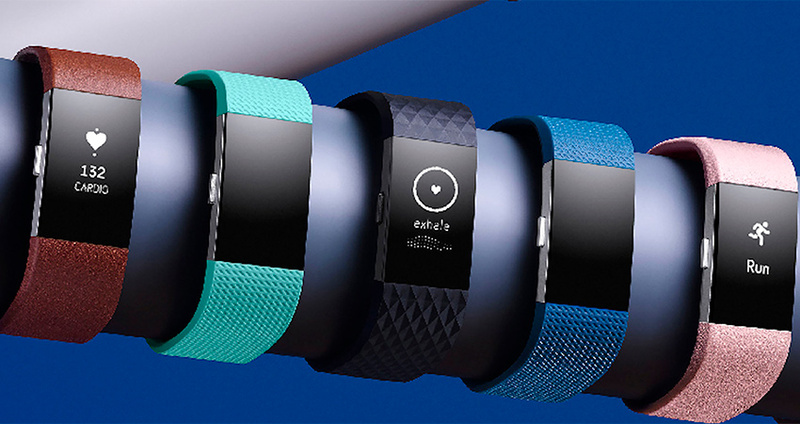 Fitbit has just released its new lineup of wearable devices, which are now available for pre-order in Canada. The two biggest updates? The Charge 2 (pictured above) and the Flex 2. Priced at $199.95 in Canada, the Charge 2 is an upgrade from the original Charge. Now there is only one model, which already comes with the PurePulse heart rate tracking built-in (so there’s no need to pay extra for the more-expensive, higher-end Charge HR). In addition, the Charge 2 has a display that is four times bigger than the original Charge and offers multi-sport tracking (similar to the Blaze), allowing users to track up to seven activities. In addition, the Charge 2 will deliver smartphone notifications like the Alta, which include calendar alerts, text messages and call notifications. Furthermore, the Charge 2 features a new feature called Cardio Fitness Level, which gives users a personalized cardio score, and another new feature called Relax, which offers mindfulness-based “breathing sessions” based on heart rate. Meanwhile, swimmers can delight in the new Flex 2. Not only is it only one of the brand’s more stylish offerings, but it’s also its very first water resistant tracker, replacing the brand’s current affordable offering, the Fitbit Flex. The Flex 2 is Fitbit’s thinnest device yet — 30 per cent smaller than the Flex— and the company’s first-ever device to track swimming. It is water resistant up to 50 metres and is safe for both the pool and the ocean, plus, it boasts a battery life of up to five days. The trackers are now available for pre-order in Canada, with shipping towards the end of September or early October.